Autographed by both Joseph Smith and his brother Hyrum, this letter is dated 1839 and is very rare as it contains both of the brothers’ signatures. 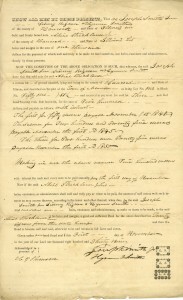 The document served as an instrument for the sale of a home property in Nauvoo, Illinois, between Sidney Rigdon and the Smith brothers. Signed documents by Brigham Young, Joseph Smith, Hyrum Smith and many others from The Church of Jesus Christ of Latter-day Saints are among a significant collection of original manuscripts recently donated to the University of Utah’s J. Willard Marriott Library. Valued at more than $3 million, the collection resides in Special Collections and marks the single-most valuable collection ever contributed to the U’s library. The gift contains original documents that are handwritten and signed by numerous early church leaders dating from 1839 through the end of 19th century. The papers document activities and events having occurred in Nauvoo, Illinois, as well as the settling of Utah. Nearly all of the 13 archival documents are in perfect condition. 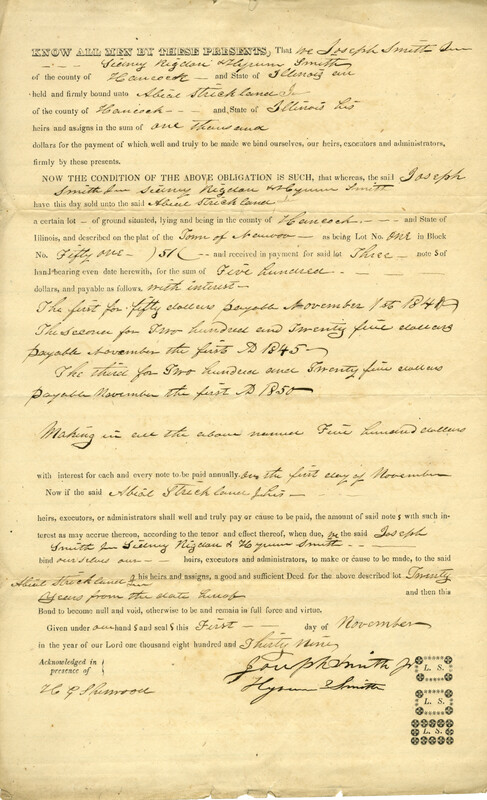 The earliest example includes an autographed paper by both Joseph Smith and his brother Hyrum in 1839 that notes the sale of a property for a home in Nauvoo. A second example, dated 1859, is a four-page letter to early church officials in Missouri and New York from Brigham Young detailing instructions for bringing 100,000 members of the Church of England and Europe to the United States and the logistics of their westward migration. The archive can be viewed in Special Collections on the fourth floor of the library.